Collective Civil has been providing customers with quality erosion control and earth retaining structures since 2001 with a diverse range of retaining wall systems, erosion and environmental controls. We have proven our high level of knowledge and expertise through a broad range of project constructions, which continues to grow ensuring our clients reap the benefits. You can rely on our knowledgeable and experienced team members. 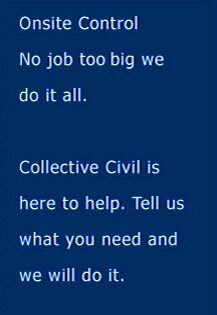 Our valuable supervisors have been with Collective Civil right from its’ beginnings’ which proves our strength as a long standing team. Expect to deal with a positive can-do attitude of our team members who will make the right choices and take the right steps to exceed your expectations. Our commitment to all projects- big and small means that they are completed to perfection. This is demonstrated through a set of processes, quality products and construction methods which ensure the client’s satisfaction. We act promptly to development changes with a positive approach to meet project objectives.